This roast pork loin with potatoes recipe is very easy to prepare. Seasoned with garlic, onion, thyme and chives, this dish is flavorful and juicy. It is also simple to put together on a busy weeknight—sprinkle with a few seasonings and place in the oven to cook. The pork loin is actually the muscle tissue along the top of a pig's rib cage. It is a lighter and more affordable alternative to a beef tenderloin and is prepared and cooked in the same way. Pork is still the "other white meat," and optimal for those watching their cholesterol and fat intake as it has significantly fewer calories, fat, and cholesterol. It has a mild taste—similar to chicken—and is the perfect blank canvas to add your personal touch. 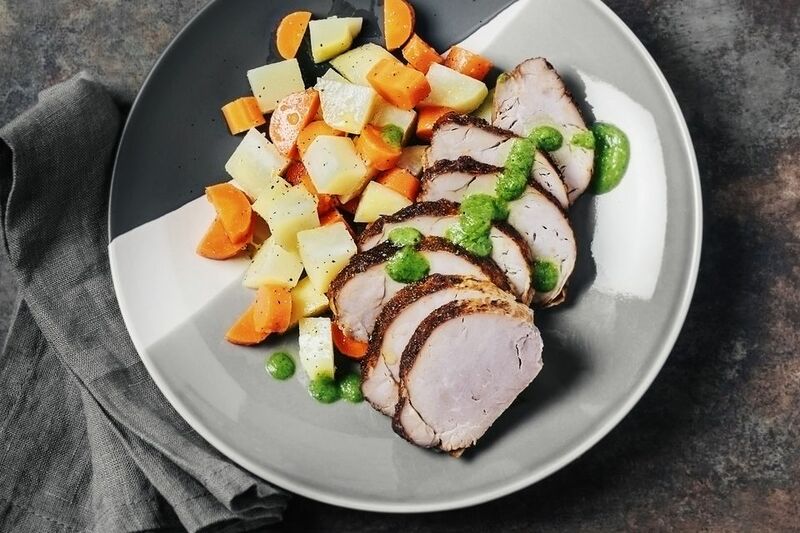 Serve the pork loin and potatoes with a vegetable side dish for a complete meal that may feel too special to serve to the family in the middle of the week! Rub the pork loin with 1 teaspoon of garlic powder, 1 teaspoon of onion powder and 1 1/2 teaspoons thyme. Sprinkle with salt and pepper and place the pork loin in a shallow roasting pan. Roast for 50 to 55 minutes. Meanwhile, peel and quarter the potatoes. Cook in boiling water for about 10 minutes. They should still be firm. Drain, let cool and place the potatoes in a large bowl; toss with olive oil, 1 teaspoon dried thyme, chives, 1/2 teaspoon garlic powder and salt and pepper. Place the potatoes around the pork loin, and roast an additional 45 to 60 minutes, or until the pork registers at least 155 F on a meat thermometer. Cover the roast pork loin with foil and let it rest for about 15 minutes before slicing.